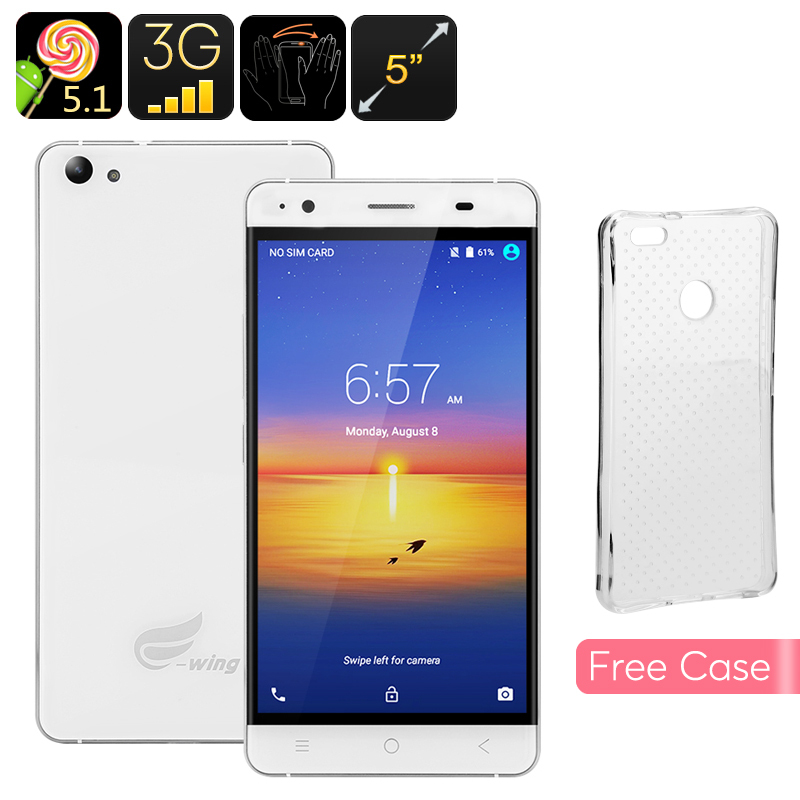 Successfully Added Ewing E9 Android Smartphone - Quad Core CPU, 5 Inch Display, Android 5.1 OS, Gesture Sensing, 2200mAh, Smart Wake (White) to your Shopping Cart. Beautifully designed from the outside the E-Wing E9 has been coated in 2.5D glass held together by a modern and sleek looking metal alloy frame. With its shiny reflective surfaces this budget Smartphone is a real eye catcher. Featuring a Mali GPU and 1GB of RAM this Smartphone is guaranteed to handle graphics efficiently, allowing you to enjoy all your movies and games in proper quality. Multitasking should neither be an issue for this Smartphone as its Quad-core CPU is powerful enough to deal with all the daily Smartphone activities of the average Smartphone user. Equipped with a built-in 2200mAh battery the E-Wing E9 provides up to 8 hours of continuous usage time – enough to get through the day without having to charge your cell phone. Its 5 Inch HD display allows you to take the most out of this usage time by providing you a platform to enjoy all your favorite games, video’s and Apps in HD quality. With Google Play installed on this Smartphone countless hours of fun and entertainment lay ahead of you. The phone’s built in camera’s that are located at both the front and rear of the device allow you to snap pictures and selfies in great detail. Thanks to the phone’s dual SIM support you now have to choice on whether to equip your Smartphone with two SIM cards or alternatively swap out one of the SIM cards for a micro SD card – providing you with up to 32GB of extra storage space to save all your HD pictures, movies, and other multimedia files. The Ewing E9 5 inch smartphone comes with a 12 months warranty, brought to you by the leader in electronic devices as well as wholesale China Smartphones..